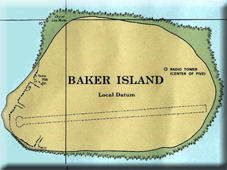 This island lying half way between Hawaii and Australia was initially discovered by the US Captain Baker, hence the name, in 1832. The Americans actually claimed it until the British claimed it for themselves in 1886. It was mined for its guano deposits. The Americans retook it in 1934 and used it as an air station during World War two, It is currently a wildlife refuge.